If you’re after a PlayStation 3 console or some Beats headphones then the stock of the now-defunct Phones 4u is a good place to start. 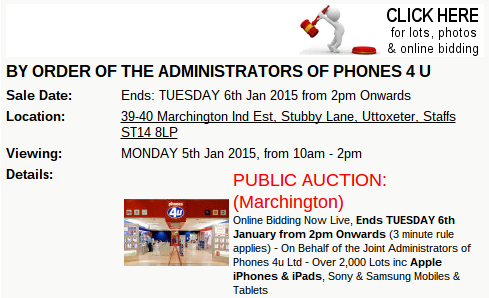 Starting tomorrow with viewings at 10AM, the bidding starts now on the auctioneers website. There’s also Bluetooth headsets, smartwatches and tablets with pretty reasonable prices. Head down to Marchington in Uttoxeter tomorrow if you want to see everything in the flesh. This is yet another auction of stock following the closure of all their stores. Here’s a look at some of the deals..
CES - Liquid Z410 4G Smartphone announced. Mid-range and cheap.